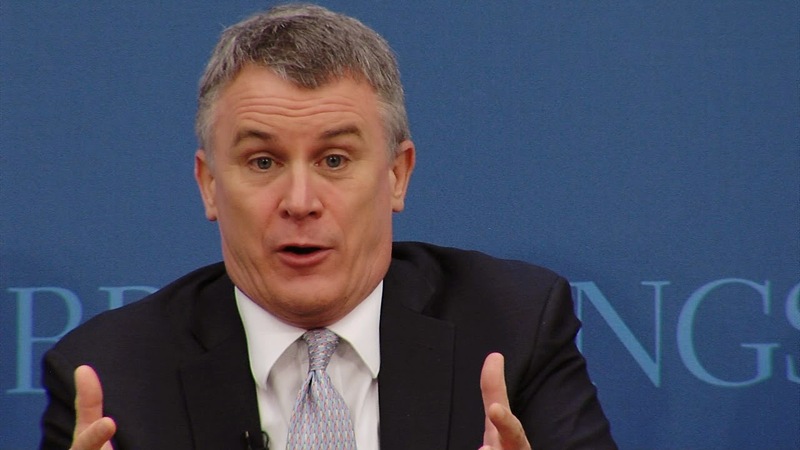 Michael Doran, former Bush Administration Defense Department and National Security Council official, has a propensity for bad ideas and weak powers of deduction, expressed often in his analysis for the Brookings Institution, where he is a fellow. What the Bush administration seems to understand better than its critics is that the influence of the United States in the Arab-Israeli arena derives, to no small extent, from its status as the dominant power in the region as a whole -- and that this status, in turn, hinges on maintaining an unassailable American predominance in the Persian Gulf... [D]efeating Saddam would offer the United States a golden opportunity to show the Arab and Muslim worlds that Arab aspirations are best achieved by working in cooperation with Washington. If an American road to a calmer situation in Palestine does in fact exist, it runs through Baghdad. Doran concluded, "The first order of business for the United States must therefore be to demonstrate forcefully that challenges to its authority in the region will be defeated," adding that "[t]hwarting Saddam's ambitions and continuing to root out bin Laden's henchmen and associates, moreover, will do more than take care of immediate menaces. It will also serve to sober up onlookers with oppositionist ambitions of their own, making them recalculate the odds of defying a power that has demonstrated its intention to remain a permanent and dynamic regional player." Following the invasion, Doran argued against international inspectors returning to Iraq to investigate, once and for all, the veracity of WMD allegations. His reasoning? Facts and war crimes don't matter because haters gonna hate regardless. "The many skeptics of U.S. motives fall into two camps: conspiracy theorists and sophisticated opponents of the war," he said in May 2003. "No amount of rational argument will persuade the former, who will react to any evidence of WMD with the claim that Washington planted it—after all, don't American forces today exercise unfettered control of the crime scene? For their part, the sophisticated anti-war forces never disputed the existence of WMD." Obviously, those wily conspiracy theorists were able to spirit away Saddam's nefarious WMD arsenal in order to prevent the U.S. government's (and the "sophisticated anti-war forces") inevitable vindication. Clearly no stranger to advocating for American imperialism and intervention in the opinion pages of major publications and an unequivocal champion of Israeli war crimes and militarism at every turn, Doran is really excited about the bombs falling on the defenseless civilians in Gaza. Ok, first, unless "Republicans" is a synonym for "Americans" (which may be the case if you're Doran), the chart's overarching claim is wholly incorrect. It was misleadingly titled by Statista's media relations manager Niall McCarthy, who originally created and posted the infographic. The word he was looking for was "plurality," not "majority." After all, "more than" doesn't always mean "majority of." The results of the poll actually show that 40% of Americans blame Hamas more than Israel for the recent round of violence, while half that hold Israel more accountable. Moreover, nearly 30% had no opinion. For their part, voters who self-identify as Democrats were effectively split on the matter. Regardless, however, and more importantly, this is obviously a useless metric of anything. It's essentially the same as tweeting, "Look, more Americans believe the lies they're told by people like me and a prostrate press than not." Wow, what a revelation. Naturally, due to ciphers like Bob Schieffer, Jodi Rudoren, Wolf Blitzer, David Gregory, and their mainstream media outlets, the American public is massively disinformed on the reality of the Israeli assault on Gaza. But, for Doran, this is to be celebrated, not challenged. After all, in 2007, he was appointed Deputy Assistant Secretary in Support of Public Diplomacy under Eric Edelman in George W. Bush's Defense Department. In this role, Doran was essentially the Pentagon's minister of propaganda, focusing on "strategic communications" to sell the administration's military policies to the gullible masses. Of course, one need only review the record of American public opinion on foreign policy issues to know that Doran's tweet is more embarrassing than triumphant. While the public is often not nearly as hawkish as most of the country's elite influentials - think tank pundits, government advisors, editorial boards - media coverage and official messaging is hugely important to crafting public opinion. What Americans "believe" is often not remotely related to what is actually true. For instance, in January 2003, a poll found that 44% of Americans believed that either "most" or "some" of the 9/11 hijackers were Iraqi. Actually, not a single one was. In the months preceding the invasion of Iraq, Americans consistently reported their belief that Iraq played a major role in the attacks. A poll conducted the week before the invasion itself showed that 45% of the U.S. public believed Saddam Hussein was "personally involved" in the September 11 attacks. The next month, that figure has risen to 53%. In a poll published in September 2003 - nearly six months after the invasion of Iraq - almost 70% of Americans believed Saddam Hussein was "personally involved" in the attacks. 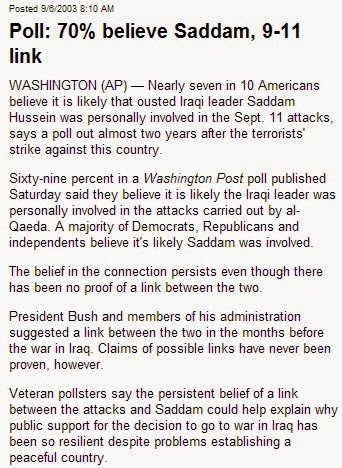 By 2007, 33% still thought Saddam was "personally involved" in the 9/11 attacks. These findings have been relatively consistent ever since. In 2011, around the tenth anniversary of 9/11, the University of Maryland's Program on International Policy Attitudes (PIPA) released a poll finding that 38% of Americans believed that the United States had "found clear evidence in Iraq that Saddam Hussein was working closely with the al Qaeda terrorist organization." Plus, 15% believed Iraq was directly involved in carrying out the attacks, 26% believed Iraq had WMD before the invasion and 16% even thought that WMD were actually found in Iraq. Obviously, that isn't true, and was even admitted by the U.S. government itself over seven years earlier. The following year, a Dartmouth survey revealed that "63% of Republicans still believe that Iraq had weapons of mass destruction when the U.S. invaded it in 2003," as reported by Jim Lobe. In April 2013, 28% of American voters still thought Saddam was directly involved in 9/11. But, facts are rarely important when it comes to such matters. Imagine the impact that being subjected to decades of constant hasbara has on the American mind. In fact, it's a testament to the waning influence of such propaganda that the numbers cited by Doran aren't even more appalling.